FREE: Breakfast, courtesy bus pick up, 30 Mins free WiFi per day ($2 a day), fresh linen, Jacuzzi, swimming pool , hammocks, table tennis, sundeck, luggage storage, movies, sports channels, BBQ area, body boards, sunscreen, on-site parking and nightclub passes. Facilities include en-suite bathrooms in all rooms, rooms cleaned daily, female only dorms, large communal kitchen, massive central courtyard ,lockers in all rooms, cinema room, 50ft pool, 24hr full site Wi-Fi, pool tables, laundry, bike & surf board hire, tour desk and nightly entertainment. 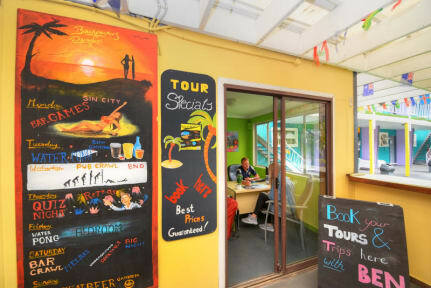 Our on-site Paradise Café; open in the morning and evenings serves hot meals & barista made coffee, while our famous Billabong Bar mixes you up the coolest drinks. Really cool place, really helpful staff. Nice rooms, bathrooms and common areas. I’ll be back for sure. Good hostel. Kitchen could be better, kind of small. Cool pool and pool table, although did not see much people using it. I got a private (7A) and during the night with the lights on, even when the curtain was down, people on the corridor could see everything inside my room. No privacy at all. 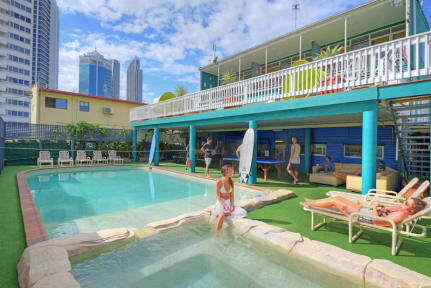 Good location, within a walking distance to the beach and surfers paradise central area. Great facilities and common area that makes it easy to getting to know peolple. Tour shop with good prices and helpful staff. Breakfast is a nice bonus! The room and restroom were dirty and there wasn't enought locker's in the room for 8 people. The people do a lot of noise (talking loud, playing music , closing the door and hitting the wall). But the employees were very nice and the location is good.